The MG37020A Fast Switching Microwave Signal Generator series also offers the high output power, low phase noise, excellent spectral purity, and high performance pulse modulation. For example, the MG37020A can provide guaranteed +23 dBm at 20 GHz with -86 dBc/Hz phase noise at 10 kHz offset. This level of performance eliminates the need for external amplification, and enables the verification of tough spectral purity requirements. The MG37020A offers high performance pulse modulation capability for signal simulations from simple to the complex. The MG37020A pulse modulation option includes an internal waveform generator, capability for single, double, triple, quadruple and pulse burst modes, with leveled pulse widths as narrow as 100 ns and unleveled as narrow as 10 ns. The MG37020A offers enhanced connectivity and intuitive user interface with color touch screen. Remote programming interfaces include USB 2.0 device Ethernet LAN, IEEE-488 GPIB. The MG37020A can accommodate a USB mouse, keyboard and external VGA monitor. The MG37020A Fast Switching Microwave Signal Generator along with the MG3690B family of microwave signal generators provide the highest performance for nearly every microwave application. Choose between many performance and capability options for your specific application. 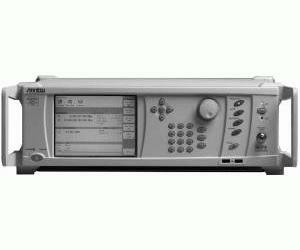 Anritsu microwave signal generators minimize your investment level while maintaining confidence to affordably upgrade for future needs. Both the MG37020A and the MG3690B are highly reliable and backed with a complete 3-year warranty as a standard feature.